It is an ancient art. The chief difference between garden design and landscape architecture is that one is concerned with private space and one with public space. The public park is an area of overlap - and the origin of the landscape profession. 'Landscape architecture' is now recognised by the International Labour Organisation and represented by the International Federation of Landscape Architects (IFLA). Most countries now have professional associations concerned with landscape architecture. In addition to a limited amount of garden design work, landscape architects work on roads, reservoirs, river reclamation, quarries, forests, housing development, industrial estates, urbanisation and many other types of project. 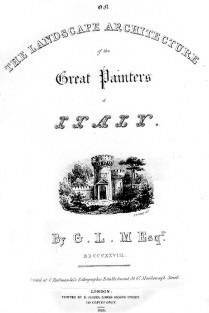 The origin of term landscape architecture is in a book published by Gilbert Laing Meason in 1828 on the Landscape Architecture of the Great Painters of Italy and provided information on a special type of architecture which could be seen in the landscape painting of the great painters of Italy. Many of Meason's examples show Italian buildings in verdant countryside. The book is not well known, because only 150 copies were printetd and few survive. But thanks to Google Books and the New York Public Library it can now be read online by everyone. With regard to the landscape architecture profession's future development, one of the key points made my Meason relates to public goods. Quoting Maculloch, he wrote that: 'The public at large has a claim over the architecture of a country. It is common property, inasmuch as it involves the national taste and character; and no man has a right to pass himself and his own barbarous inventions as a national taste, and to hand down to posterity his own ignorance and disgrace to be a satire and a libel on the knowledge and taste of his age.' This principle is reflected in the professions central involvement with public goods and the public realm. 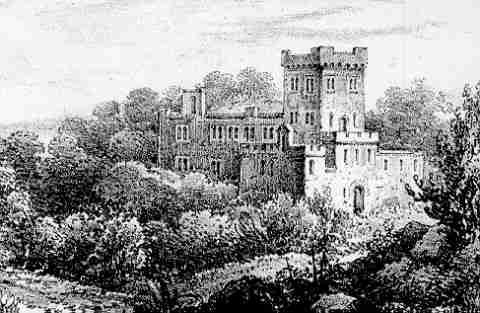 John Claudius Loudon was taken with the term Landscape Architecture, praised it in the Gardener's Magazine and cited Deepdene as an English example. Loudon's American admirer, Andrew Jackson Downing, took up the term and used it as an equivalent term to Rural Architecture. When Downing's admirer, Frederick Law Olmsted, took up the term he gave it a different meaning. Olmsted switched the emphasis and used landscape architecture to describe a special type of scenery, set amongst buildings. Central Park was the first great example of Olmsted's art. Next, Olmsted planned a great series of parks in Boston. His work was greatly admired in Europe. In 1903 two men used the term in connection with a competition for the design of Pittencrieff Park in Dunfermline: Patrick Geddes and Thomas Mawson. Later, they became founder members of the British Town Planning Institute and in 1929 Mawson became first president of the Institute of Landscape Architects, now the Landscape Institute. Like the garden designers of old, landscape architects are concerned with the design of outdoor space using Vegetation, Landform, Water, Paving and Structures. From the theoretical point of view, Olmsted was correct: landscape architects compose the elements which define space but the overall objective is to design space (or 'create good outdoor places').